Bula! We arrived on Monday 7th July at about 6 in the morning through the pass. For the last 3 days we’d had gale force winds, heavy squalls and very rough seas. We had a triple reefed main and staysail and Duet was flying. We were exhausted by the motion and thoroughly glad to be in. 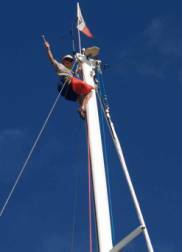 Now the sun is shining, the wind blowing still strongly but Simon has been up the mast to do the repairs!